Rope style Sterling silver Star of David outline with enamel filled points create this unique pendant necklace by Idit Jewelry. Unique silver work creates this rope looking Magen David pendant charm necklace. Adding the blue-green enamel in the 6 points makes for a striking piece of Jewish jewelry that can be worn with any outfit. Lovely silver chain is available in either 16 inch (40.5 cm) or 18' (45 cm) lengths. Idit Jewelry is handcrafted in Israel by Jewish artisans. 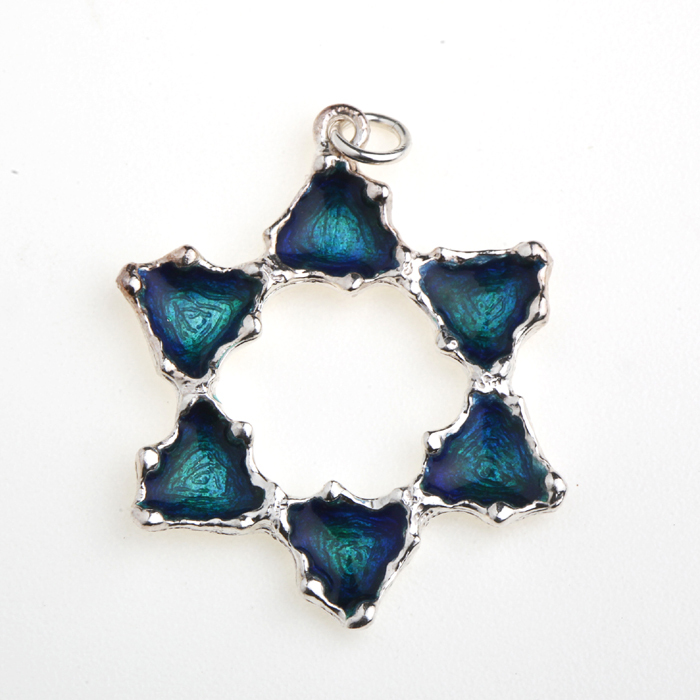 Idit's sterling silver and enamel jewelry makes a wonderful gift for anyone who follows trends in contemporary Israeli jewelry design, and a great souvenir of a visit to Israel. Fans of handmade sterling silver jewelry and enamel jewelry will love these pieces!